Back in July of this year, the horror community received the 1st issue of Eibon Press/Fulci Comics’ much touted new comic based on Lucio Fulci’s Zombie. There was plenty of hype regarding the release, what with limited edition signed copies and protector sleeves featuring original artwork from the series’ artists. The issue received praise from this reviewer for, at least marginally, expanding upon the past lives and inner monologues of the film’s characters without re-writing the established story line. Issue #2 picks up where the 1st issue left off. Peter and Ann, the characters portrayed in the film by Ian McCulloch and Tisa Farrow, have boarded the boat of Brian and Susan (as respectively portrayed by Al Cliver and Gay Auretta) to begin their search for the tiny, mysterious island of Matool. Meanwhile, Dr. Menard’s wife, Olga, has lost her patience with her husband’s dedication to “science” and demands off the island. This leads to some inner-monologues from both that expands the story of their pasts, as well as furthering establishing their motivations. This helps their relationship carry more emotional depth than in the film, where scenes featuring exchanges between the two are few and fleeting. While the new backstory for Menard is what one might have expected, the revelation that Olga is a former Saigon prostitute may come as a surprise, but thankfully doesn’t change what fans have come to know about these characters in the 35+ years since the film’s initial release. Look for a Doctor Butcher, M.D. reference among Menard’s many inner monologues. The pivotal moments from the film re-created for this issue include both the notorious “eye splinter”scene, as well as the infamous “shark-vs-zombie” scene. It seems fairly safe to say that these are easily the 2 most memorable scenes from the film, the ones most frequently mentioned whenever the film is discussed. The “eye-poking” loses most of the brutal dynamic that it carries in the film, solely because the scene is much more drawn out in the film and the payoff is much more viscerally disturbing when captured on celluloid. The shark-vs-zombie battle comes across arguably less silly here than it does in the film, although it is handled in pretty much the exact same fashion as in Fulci’s original. The key difference here is that the transfer to the new medium allows more insight into Susan’s thoughts and memories. The issue ends with Brian’s boat arriving at the island of Matool, presumably setting up issue #3 for the discovery of the dangerous circumstances surrounding the small secluded island, as well as the discovery of Olga’s scattered remains. The issue concludes with an introduction to Eibon Press’s highly-anticipated upcoming Gates of Hell (aka City of the Living Dead) comic series, as well as a look into the creation of the Zombie series and Fulci Comics as a whole. As with the first issue, Zombie #2 comes packed with a few neat little extras. 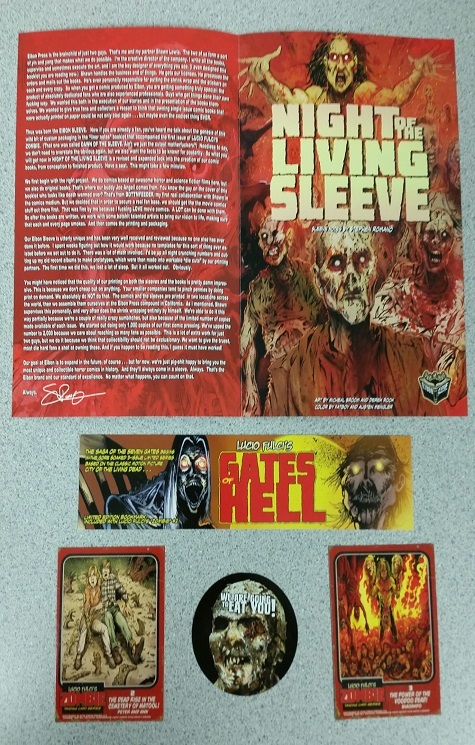 Included in this issue are a Gates of Hell bookmark, a “Worm-Eye” sticker, 2 trading cards, and a short insert focusing on the unique Eibon sleeve, as well as the process that goes into packing, labeling, signing, and shipping each issue. Issue #3 of Zombie is now available for pre-order on http://www.eibonpress.com.